Is it snowing in Davos ?ありがとうございました! 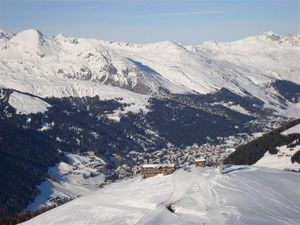 Davos is a skiers town with 60 lifts and 318km of prepared runs. The top lift is at 2844 meters. There are 3 mountain trains, 12 cable cars, 14 chair lifts, 24 T-bars, 5 childrens tows and 2 childrens escalators on 7 mountains (1 east facing, 2 west facing, 2 south facing, 2 skiable on all faces being possible to stay in the sun all day). 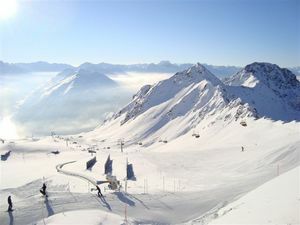 The area has 12 marked alpine walking trails, 1 avalanche training center, 4 fun parks, 4 sled runs, 35 on-piste restaurants, 1 natural ice skating rink (free and free ice skates supplied), 2 commercial ice rinks (1 inside & 1 outside), 2 train stations Dorf and Platz Dorf (being 100 meters from Parsenn biggest pisted skiable vertical drop at 1900m. 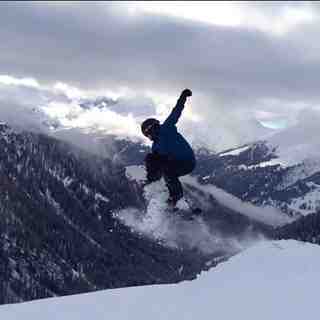 Biggest off-piste vertical drop 2200m). The longest marked piste is 15 km, longest off-piste is 24km. There are 13 marked but unprepared and uncontrolled off-piste runs, 140 off-piste tours of various difficulties from advanced to expert and the regional day pass includes all mountains, all buses in Davos and Klosters and trains between Kublis and Glaris. 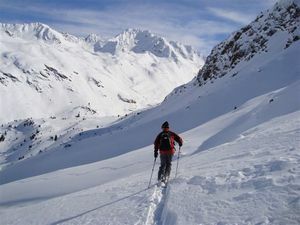 The most advanced skiing is off-piste with a few day tours without walking and unlimited non-walking powder skiing between pistes and resorts; a guide is essential. Davos/Klosters has 3 in-town beginner areas and several tree runs which are open in the worst weather making it skiable every day of the season. The trail/piste maps are too big to be displayed with only the main ski area of Parsenn/Gotchna listed. The 7th mountain, Shatzalp, has reopened for skiing with access via a mountain railway from the middle of town or from Hauptetälli on Parsenn through the gallery (only with a guide) with a double chairlift and 2 surface lifts. A separate ticket is necessary to use the facilities on Schatzalp. Pischa is a free-ride mountain with cable car access, with the rest of the south facing slope left as natural snow for learning to ski and ride powder. 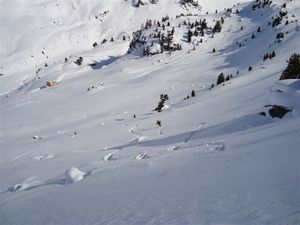 There are also 6 advanced off-piste runs to the valleys on all sides from 6 to 12 km long with bus access back to the cable car or town. 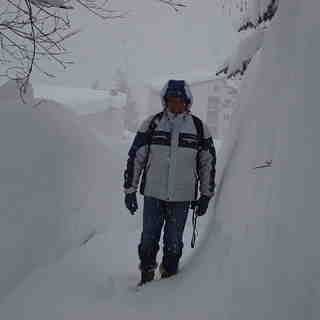 I initially planned to stay 6 days, but extend to twelve as it just would not stop snowing fresh powder. Arrived by car from Zurich, which was under 2hrs. However, the car was redundant upon arrival as it was more convenient to take the bus service in town (free pass given with accommodation), which runs frequently to the slopes and watering holes. I departed by train, which took around 2.5hrs with one change, so no big ordeal to use public transport for the entire trip. Spent most of my time on the slopes of Parsenn, which was the largest resort, and had lots of easy access and challenging off-piste. The après-ski only really springs to life at weekends when the German and Swiss hit town. 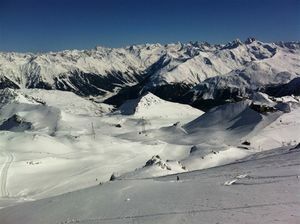 However, the up-side is during the week you’ll have the slopes virtually to yourself with no dreaded lift queues. I’ve boarded in the US, Japan, Austria and France, and other places in Switzerland. Davos is up there with the best of them. I’d highly recommend Davos if you board or ski and the main purpose of you trip is to push yourself on the slopes (particularly if you want easy access to plenty of good off-piste), rather than the après-ski.